TEENAGE playmaker Dylan Brown is set to be heavily targeted in his first year of NRL football - and the Parramatta forward pack knows it. In a strong show of support for one of rugby league's Next Big Things, several Eels forwards have significantly beefed up to ensure they provide the necessary protection - and momentum - for the incoming New Zealand rookie. Apart from being reigning wooden spooners, Parramatta were often criticised in 2018 for being too small up front. As a result, coach Brad Arthur has added some significant muscle to several key forwards - with prop Daniel Alvaro, who won the Ken Thornett medal as the Eels best last year, adding a staggering 6kg. He now weighs in at 115kg. 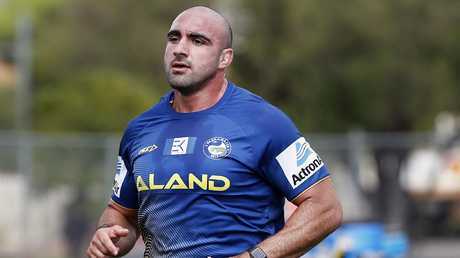 Club favourite Tim Mannah is also training at 111kg, up four kilos. 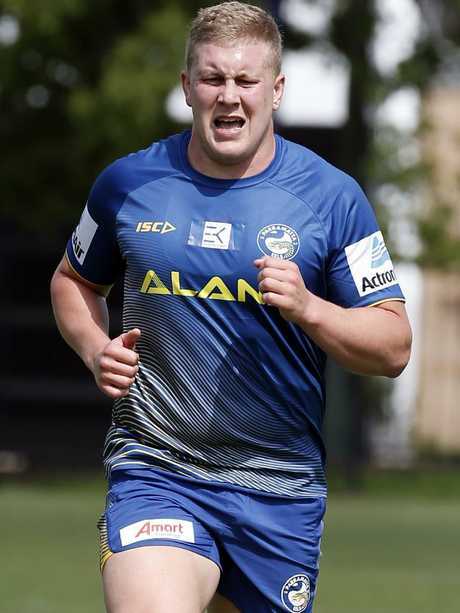 Elsewhere, the Eels coaching staff has also been quietly impressed with the pre-season efforts of heavyweight recruits Junior Paulo (127kg) and Shaun Lane - who at 6'8'' (202cm) stands among the tallest players in the game. Asked if the Eels were ready to protect their young playmaker in 2019, lock Nathan Brown said: "We'll be looking after him just like you always want to look after each other. "And we've definitely got some heavy hitters here. "While my weight is basically the same - I can't really afford to carry any more - a lot of our forwards have added around five kilos of muscle. "Guys like Timmy Mannah and Daniel Alvaro, they're looking really strong. "And a couple of our main recruits, Junior and Shaun, they're big boys too. I know Junior reckons this is the fittest he's been in years while Shaun is definitely going to be that big, tall presence on an edge." 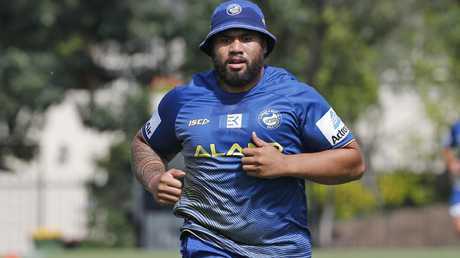 While Paulo arrived at the Eels weighing 132kg, a brutal pre-season has seen the Samoan international drop five kilos. Parramatta have also signed Roosters premiership winger Blake Ferguson, convinced he can bring plenty of momentum at the start of sets. All of which is good news for 18-year-old Brown. Weighing just 85kg, the rising New Zealander has already been announced by coach Arthur as the man to replace departed No. 6 Corey Norman in the halves. Yet despite the hype and headlines that have already preceded his impending debut, the Eels know his impact will be heavily influenced - just like every other playmaker - by the platform they can provide him. Indeed, throw any youngster behind a struggling pack and, 99 times in 100, the result is a bloodstained chalk outline. Which is why the Eels High Performance unit have worked to add serious muscle to a forward pack that wasn't only among the smallest and lightest in the competition last year, but continually outplayed. As the first NRL team back to pre-season training, the Parramatta coaching staff have also had the necessary time required to not only make the necessary weight gains, but ensure players are able to carry every extra kilo. "Dylan's a really good kid too," Brown continued. "Humble, extremely fit. "And I'm excited for him and the great opportunity he's now got here. "From what I've seen he doesn't seem to fussed about coming into first grade and is really respectful, he's always looking to learn off the older boys." Every game of every round of the NRL Telstra Premiership LIVE with no ad breaks during play. SIGN UP NOW!